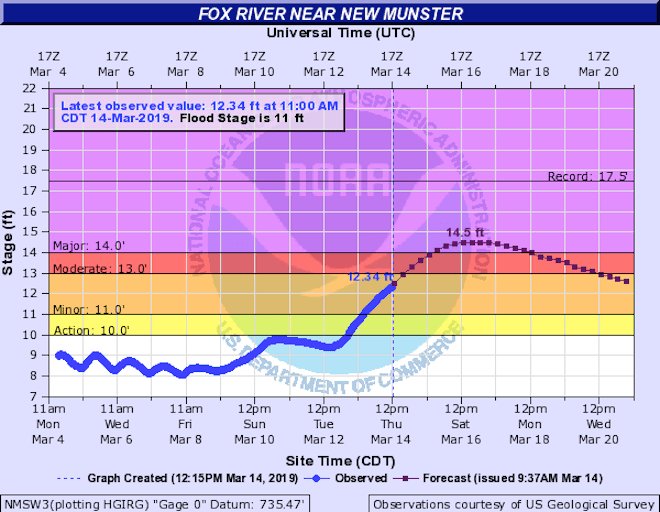 According to National Weather Service projections, the Fox River in New Munster could rise to 14.5 feet by Saturday, which will produce major flooding in the area. With flood stage at 11 feet, and current projections, the National Weather Service is continuing a flood warning. Meanwhile, Kenosha County authorities are reminding residents to take necessary precautions and avoided flooded roadways, which could be closed, the county’s Emergency Management Facebook page states. For residents in need of sandbags, they can pick them up at the Highway Pit, 32302 116th St., during business hours. “You can either take them with or fill them on site,” County Emergency Management states. Residents who arrive after hours can call 262-857-1870 and request assistance.